For those of you in awe of the diversity of modern Lego and the huge current range of mini-figures, you might just be old enough to remember the very first, more basic Lego people. 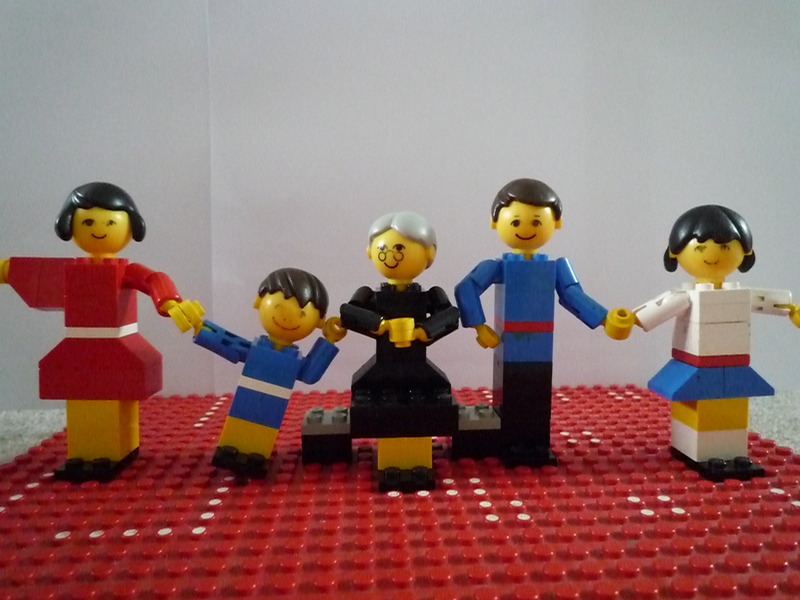 I found this, my own Lego family (circa 1974) while we are here in Devon staying with my parents. (All intact apart from one missing arm, but then the Lego shark is also missing which might explain it….) Sons are very excited about how much they could sell them for on eBay! Running and BMF is continuing after Juneathon, with training for two Half Marathons and a 10 mile race in the autumn. I am following a half marathon plan adapted from one in this months Runners World, (see my HM training page). I have made it more flexible so I don’t get stressed if I can’t do it exactly and then give up after a couple of messed up or missed days. The objective is to try to meet the weekly mileage in anyway or combination. I’d like to do at least 4 runs a week (BMF counts as 2.5 miles) and try to do one long run and an interval or tempo session (or parkrun) each week to 10 days or so. Today we went for a lunchtime walk by the river Exe along to Exeter Quay. A nice walk along the river and an even better stop at The Waterfront a perfect combination of pub and pizzeria where we sat outside and enjoyed a couple of their dustbin lid (sized) pizzas. Even 5 of us, including my food dustbin teenager were finally defeated and a couple of slices had to be brought home for breakfast. So this evening having sussed out the route and feeling guilty about the amount of pizza consumed I set off for a run. Running it turned out a bit shorter than it felt walking earlier but as always I enjoyed running somewhere new. It’s a popular place to run either side of the river and my loop felt like Exeter’s equivalent to the Serpentine. The downside was that the paths are quite narrow in places and are shared use with cyclists and pedestrians. It is obviously also a commuter route home and being 5.30 it was busy. I did get very peeved by the behaviour of some cyclists who seemed to think that they had every right to continue at full speed on narrow paths, and by ringing their bells and shouting, runners and pedestrians would jump out the way and stop halfway up the hedge to let them pass. Grrrrr. I restrained myself generally however one cyclist did get my sarcastic response ‘I DID hear you’ when he kept ringing his bell behind me on a narrow part. Categories: Uncategorized | Tags: half-marathon training, lego, Lego family, Running | Permalink. So with you on the bell ringing, what if someone is deaf? Anyway I think the old sailing rule should apply, all powered boats give way to sail, eg the slowest takes precedence. Eg walkers, runners, cyclists. Sounds like a nice waterfront run other than the bully-boy cyclists. You had a Lego shark? And a whole family of Lego people? That’s posh, that is! Those cyclists you encountered sounds VERY annoying, not sure I’d have been quite so polite!